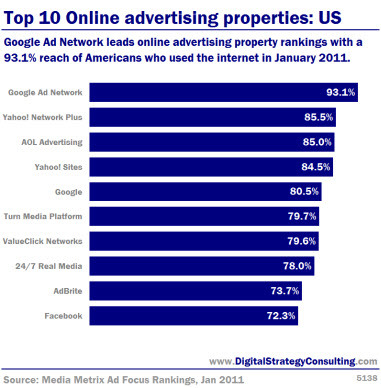 Entries from Digital Intelligence tagged with "247media"
Google Ad Network leads online advertising property rankings with a 93.1% reach of Americans who used the internet in January 2011. 24/7 Real Media is the fastest growing ad network in the UK, while Google remains top in terms of visitors, according to new data. The research, from comScore, reported the top 10 ad networks based on their reach among UK internet users in July 2010. The ranking showed that Google Ad Network remains on top, with a reach of 38.3 million internet users, or 93 percent of the total U.K. internet audience, followed by AOL Advertising (33.2 million) and Yahoo! Network (33 million). The fastest growing ad network among the top 10 was 24/7 Real Media (up 111 percent versus a year ago). 24/7 Real Media have launched a new tool which allows advertisers to target potential customers with personalised display ads, writes Netimperative. The new Search Re-Targeting service serves users who click on search engine text ads with customised display advertising on any website in the Global Web Alliance network. Display ads can be modified in relation to the original keyword a user searched for and can also relate to the purchase stage reached by a user. The system can be used for example to keep potential customers interested in potential purchases by offering discounts a month after an original search had been made. Foreign currency firm Interchange FX have carried out the first live UK trial of the system, by comparing two identical display ad campaigns. The campaign with Search Re-targeting enabled saw click-through rates increase eight times. 24/7 Real Media's Global Web Alliance network includes over 950 sites and serves ads to 121m unique users worldwide. 24/7 Real Media has agreed to be bought by WPP Group for $649m (£328m) in a deal set to close in Q3, writes Netimperative. The move follows similar recent acquisitions in the industry including Google's purchase of DoubleClick and Yahoo's purchase of Right Media. WPP's Chief Executive Martin Sorrell told Reuters that the firm considering further purchases of small to medium-sized digital advertising companies.